The Justice Society of America is no more. Thanks to the 2011 DC company event “Flashpoint,” the team was retconned right out of existence. The Golden Age greats – the Flash, Green Lantern, Sandman, Dr. Midnite and more – never existed. DC turned its back on the first and greatest super-team – and its legion of fans. All those hundreds of great stories – ranging from “All-Star Comics” No. 3 to those cosmic “Justice League of America” crossovers to the award-winning “JSA” title – have no place in the DC Universe. It’s enough to make a reader barricade himself in a bunker with his back issue collection. There has been an extraordinary amount of JSA merchandise in the last year, including two JSA books in the last two weeks. Consider the JSA omnibuses, three thick books collecting all of DC writer and creative officer Geoff Johns’ run on the book (and then some). When I first heard of the project, I thought the company was doing it as a gift to Johns, given his tenure at the company and his increasing clout on the TV/movie production side with DC overlord Warner Bros.
Three JSA omnibuses. My ‘Tomb of Dracula’ omnibus is feeling inadequate, and my ‘Massive’ manga fears shrinkage. Have you seen these omnibuses? I’m used to the Marvel ones that run about 700 pages. These run about 1,400 pages each. You could kill someone with one of these. It could be the solution to a “Clue” game. Per Degaton in the library with “JSA Omnibus” Vol. 2. These things are monsters – beautiful, addictive beasts that must be caged on your bookshelves. 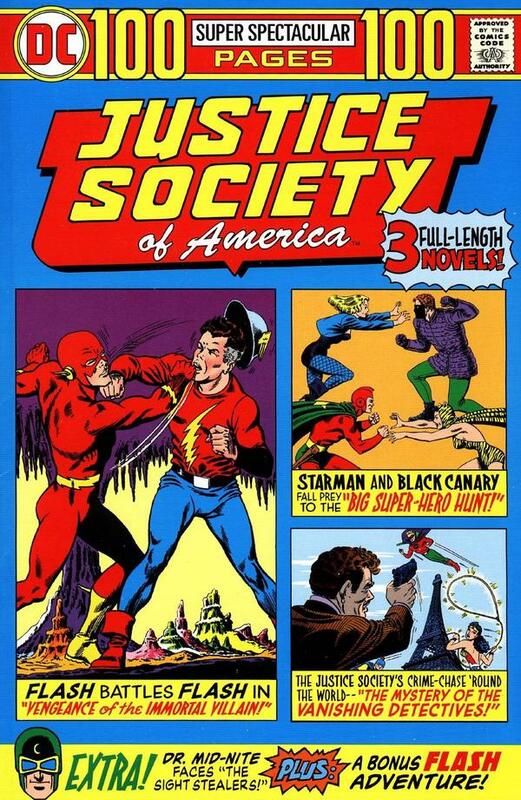 Earlier in July, DC released a trade paperback collecting the 1985 miniseries “America Vs. the Justice Society.” It’s essentially a recap of the JSA’s history through the lens of the McCarthy hearings. While interesting to fans, it was hardly a bestseller. Who would have ever thought it would ever get collected into a trade? And why now? Then there’s the hardcover “Justice Society of America: A Celebration of 75 Years” released just a week later. How wonderful – and surprising – DC remembered. The book runs about 500 pages and features an assortment of stories reprinted elsewhere – yet never to this degree of brightness. The page quality makes the Archives look like newsprint. There are also several prose pieces that offer insight into the company’s schizoid attitudes toward its first band of mystery men. You can dismiss the project as a crass attempt by the publisher to reap some more lucre from starving fans – and there may be some truth to that – but there’s more going on here. Five books in the last year for a team the company no longer creatively supports – and that doesn’t even include the monthly “Earth 2” title (more on that later). DC sure is putting a lot of effort into keeping alive a team that it allegedly doesn’t deem viable. For answers, we need to look to the big screen. It’s no secret DC covets Marvel’s movie success. It hopes to use next summer’s “Batman Vs. Superman” to launch a “Justice League” franchise with Supes, Bats, Wonder Woman, Aquaman and more. While Marvel leads at the box office, the opposite is true on TV: “Marvel’s Agents of S.H.I.E.L.D” is almost an unwatchable stew and just nicked a renewal for fall. DC has the edge, with Fox’s “Gotham” and especially CW’s “The Flash” and “Arrow.” Its “Supergirl” for CBS is getting great buzz. The show producers know they need to service the fan boys and casual viewers with larger-than-life characters. Random bank robber just isn’t going to cut it. If the heroes of the Justice League, the Big Guns, the alleged first tier, aren’t available, who are you going to turn to? 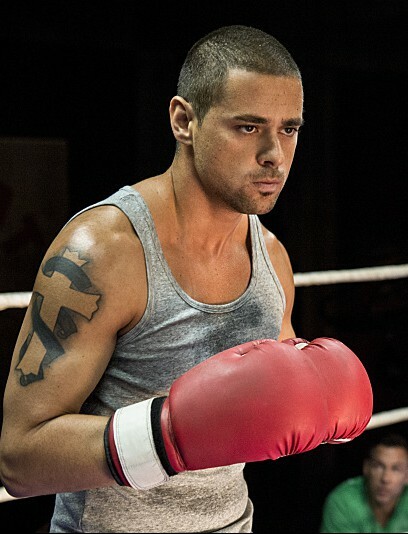 “Arrow” already introduced Black Canary and Wildcat and is adding Mr. Terrific in the new season. “The Flash” is adding the original (and greatest) speedster Jay Garrick in the fall – and the Crimson Comet will be racing over from Earth 2. Atom-Smasher is set for a guest spot. The new CW series “Legends of Tomorrow” will star Hawkgirl and introduce Hawkman. And the Justice Society hasn’t even come close to exhausting its diverse membership – nor its gallery of rogues. Dr. Fate? He’s a show in himself. With Marvel moving ahead with a “Dr. Strange” film, DC would be smart to push a “Dr. Fate” pilot to capitalize on the moment and prove it can do a mystical mage better. Johns based Stargirl on his late, beloved sister, so you know he has to be thinking about finding a home for her. It’s important to note that not all these versions of our favorites will correspond to the comics canon. “Arrow’s” Mr. Terrific looks to be the sassy gay BFF. Given all the father figures Barry Allen already has on “The Flash,” Jay could just as easily turn out to be the season’s Big Bad, Zoom. Whether by design, accident, luck or some combination of them all, the DC television universe is laying the foundation for the Justice Society. And somebody at DC is smart enough to realize that as an intellectual property, the Justice Society has great value. Back in the ’60s and ’70s, DC acknowledged that “Wonder Woman” was one of its worst sellers – yet it recognized how important the property was in other arenas of merchandising so it kept it alive. 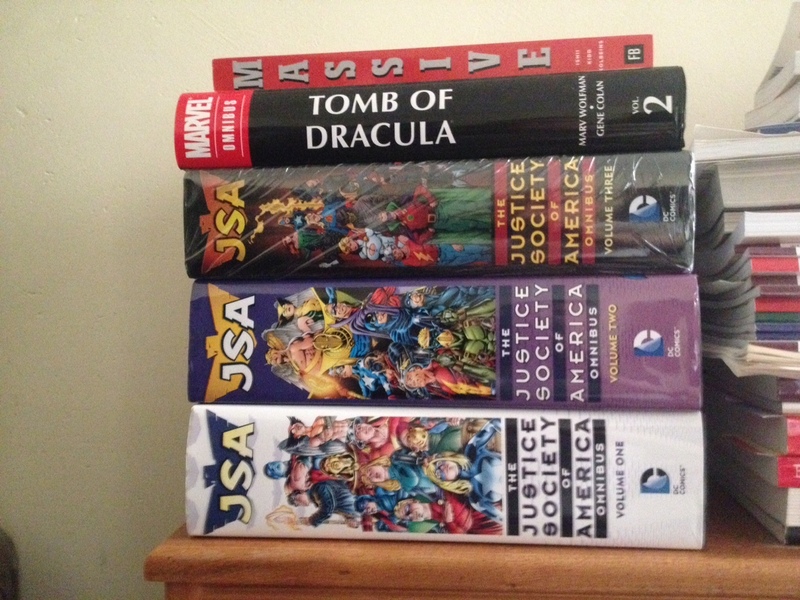 This rush of JSA books could be a case of the publisher feeding the studio and the studio feeding the publisher. The JSA 75th anniversary book way well be distributed at CW as source material. Out of the dregs of “Flashpoint,” “Earth 2” rose, with variant versions of some of the best-loved JSA members – Flash, Green Lantern and Hawkgirl, among others. Call it the Ultimate version of the Justice Society. Or call it garbage. I’m not picking a fight today. This version wasn’t tied to World War II. Instead of showing a band of heroes who inspired generations, the opposite would be true: younger heroes looking to find their own way. One of the takeaways from the 75th anniversary book is that DC now believes this Earth 2 houses the Justice Society who will carry the torch for the next 75 years. Maybe. But in four years, a team has yet to form, and “Earth 2: Society,” the latest incarnation of the book, seems like a cruel massacre of innocent trees. But with JSA members set to take over the small screen in the fall, better days just might be ahead. 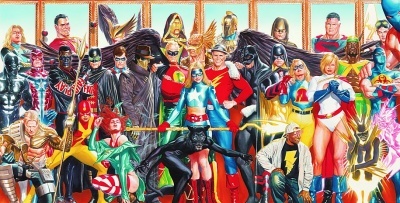 The Justice Society of America lineup circa 2005: Another Alex Ross masterpiece. One thing every JSA fan has had to hold close over the decades, whether you fell in love with the team during its “All-Star” days or its yearly “Justice League” team-ups or its “Adventure” back-up or wherever you first found the Justice Society is that hard times are always around the corner. For every theocratic editor who wants to write them off, there’s a writer who sees the glorious potential. The team endures. So do its fans. Mark!Great to see you are still a HUGE JSA cheerleader bro! I miss them too and DC is basically dead to me post Flashpoint but they will always have a place in my heart.JSA FOREVER! Raef, we may have something good coming our way. DC is shaking up its line – again – it announced this week, and there is a new JSA book coming. Could be better days ahead! I’ll just be happy to see the heroes back in continuity. Yes. Definitely want to see the JSA back. 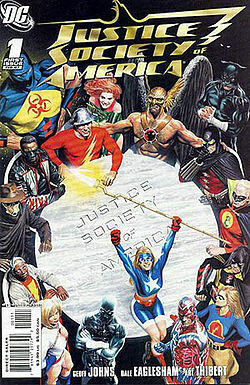 I would like to see the Return of the Original, Golden Age, All-Star Justice Society of America. At DC’s core lies the Justice Society. It is DC’s Foundation. I don’t want to see the ‘Super-Squad’ … or even the incorporation of ‘new’ members of the JSA working with the ‘old’ members…as Geoff Johns has done in the past. I would like to see the REAL THING. THE JSA written in and with today’s sensibilities. There are WONDERFUL characters in the roster. Even the supporting characters like Shiera Sanders (Hawkgirl), Sandy(side-kick of Sandman), Doiby Dickles, Inza Cramer, …. and others are rich veins to ‘mine’ along with the heroes themselves. They have great villains like Wotan, Vandal Savage, The Wizard, Degaton, The Brain Wave and others to struggle with. And the stories could be made even more exciting than previously told. I plead for a re-telling of the Legendary Tales that made the JSA the greatest Super-Hero group of all time.! !